Caring Transitions of Menifee serves Menifee, Canyon Lake, Murrieta, Sun City, Temecula and the surrounding cities. 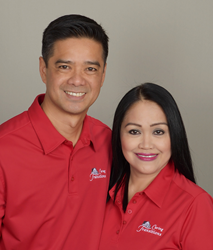 Noel and Rydell Cajudo have built their lives around service – Noel in the military and Rydell as a nurse. Now they’re looking forward to putting their passion for making a difference into their new business, Caring Transitions of Menifee. Caring Transitions’ specially trained team can handle organizing, packing, de-cluttering, moving, resettling, in-person and online estate sales, liquidations, and preparing homes for market. Caring Transitions specializes in managing senior relocations, but the services are also perfect for busy families and individuals in need of assistance. Caring Transitions of Menifee serves Menifee, Canyon Lake, Murrieta, Sun City, Temecula and the surrounding cities. “We both lost our moms within 7 months of each other – it was a deeply emotional and stressful experience and, in some ways, we are still going through that transition ourselves. We can truly empathize with what many of our clients are facing. Whether you are just looking to downsize or you need help clearing an estate, the experience can be traumatic when you’re trying to do it alone. We have the experience, understanding and expertise to help you through this transition,” Rydell said. Noel retired from the Navy in 2015 after 27 years of dedicated service. Since then, he has been volunteering to support a local library by managing the operations of a non-profit used bookstore and overseeing more than 35 volunteers. Rydell has been a registered nurse for 34 years. She specialized in intensive care and peri-operative nursing and, for the last 18 years, her focus has been on nursing leadership. They have two grown sons, Ryan and Josiah. While it was an honor serving our country and providing patient care, Noel and Rydell wanted an encore career with a chance to make a difference in their community. “We thank God for the opportunity to continue to serve others through Caring Transitions. We are looking forward to taking care of our clients’ physical transitions so they can take care of their emotional needs,” Rydell added. Caring Transitions of Menifee is bonded, insured and their W2 employees have been hand-picked and background checked. For additional information, call (951)723-5008, email NCajudo(at)CaringTransitions.com or visit http://www.CaringTransitionsMenifee.com.